An innovation-focused award for ‘New Entrant Farm Business of the Year’ is opening this autumn to UK farmers, crofters and smallholders, as part of a suite of opportunities being offered across Europe to help new entrants develop successful businesses. The award is offered by the European Commission-funded NEWBIE project (New Entrant netWork: Business models for Innovation, entrepreneurship and resilience in European agriculture), which is also offering the award in eight European countries. UK winners will get a chance to compare their farming innovations with Europe’s best new farmers. Applicants will have to demonstrate how they have been able to overcome barriers such as access to land, labour, markets and profitability, and will be judged by a panel of agricultural industry experts. Winners get €500 towards the cost of training or an international visit, as well as an award plaque, farm video, and opportunity to participate in a European new entrant conference with other award winners. They will also be profiled in the national press and at major farming industry events. 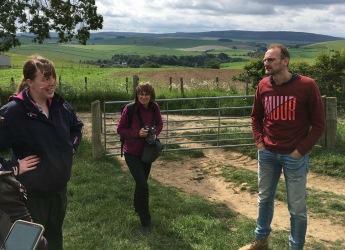 Dr Lee-Ann Sutherland, a research leader in the James Hutton Institute’s Social, Economic and Geographical Sciences group in Aberdeen and leader of NEWBIE for the James Hutton Institute said: “New entrants are critical to the future of UK farming. This award will help highlight and support creative new entrants as they develop their businesses. UK steering group member James MacKessack-Leitch, of the Scottish Land Commission, added: “There are fantastic examples of trailblazing new entrant farm businesses out there already, and as well as celebrating some of our newest and most innovative farm enterprises, the NEWBIE award will also help draw attention to the opportunities and benefits new entrants bring to the sector. Applicants can be individuals or groups, and businesses should be established for between 2 and 10 years. To enter, prospective applicants need to register on the NEWBIE website and more information about the award is available on the NEWBIE project page. The deadline for applications is 15th November. NEWBIE aims to build networks between newcomers, farm successors and their advisors across Europe, to increase the ability of farm successors and newcomers to agriculture to develop successful farm businesses. Further information about the Scottish Land Commission, and the “Guide to Joint Ventures with New Entrants” can be downloaded from their website. To find out more about the joint workshops and to book a place, visit the FAS website.